Have you ever had to deal with discomfort or tightness in your joints shortly after periods of inactivity or excessive use? You may be suffering from osteoarthritis (OA), the most prevalent form of arthritis. So, what’s going on inside your body? The breaking down of cartilage causes the bones to rub against each other, causing stiffness, pain and reduced movement in the joint. This type of arthritis generally impacts the knees, hips, neck, hands, and lower back. If you believe osteoarthritis is slowing you down, Hired Hands Homecare advises getting a thorough examination by a physician—and we’re on hand to supply the professional Marin, CA home care services to improve quality of life. The information below can help you recognize the symptoms of osteoarthritis, plus tactics to help effectively manage the condition. Stiffness or pain in joints following periods of inactivity or excessive use. Grating or “catching” experience during the course of joint movement. Bony growths at the margins of affected joints. Effective treatment approaches often include a combination of medicines, rest, physical activity, joint protection, use of cold or heat to decrease pain, and physical or occupational therapy. Many people with this type of arthritis prefer pain medications like acetaminophen or nonsteroidal anti-inflammatory drugs (NSAIDs) to help in reducing joint pain, stiffness and swelling. Maintaining physical activity keeps joints limber and sustains or enhances muscle strength. Joint protection prevents strain or stress on painful joints. Maintaining a healthy weight is important for prevention of and to slow the progression of osteoarthritis which affects the weight-bearing joints (knees and hips) and lower back. Corticosteroids or hyaluronic acid derivatives may be injected into joints that are not responding to treatment. 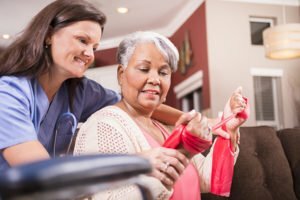 Call Hired Hands Homecare at (866) 940-4343 to learn more about our in home care services for those with arthritis and other chronic conditions, and begin to experience a better quality of life!